Anderson got invited to his first Birthday party from a friend. This is a big deal, right? We celebrated sweet eleanor in style today with barbecue, beans, cole slaw, and of course cake. 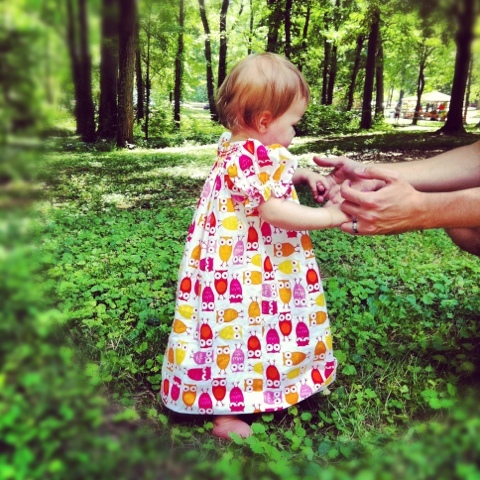 Eleanor's grandma made her this sweet dress which matched the party theme. She smocked it too. She reminded me a lot of my mother in law and as we were leaving I thought of how mamma t would be thankful I've made another Southern friend. It helps me understand Benjamin's family better seeing as I'm a Yankee and all. Later in the day we celebrated a 34 year old. No owl theme there but sill quite fun. No cute pictures from that party either. How's your weekend going? The rest of mine will involve more reading of Kisses from Katie and realistically sleep in about 30 minutes. What a cute dress. Wish you had gotten a photo of the smocking. I used to smock Annemarie's and her sisters' dresses.